It’s that time of year again; as the leaves start feeling the icy grip of fall approaching and start changing colour in some desperate attempt to give their short lives meaning, Second City has opened up their Fall Revue, Click Bait & Switch, for sketch comedy and improv fans alike to enjoy in the Second City mainstage theatre. Taking inspiration from those annoying ads that those of us without adblocker experience every time we go to an aggregate site, Click Bait and Switch provided a smorgasbord of sketch comedy, linked only through a variety of (quite possibly real) click bait headlines. From shame culture taken to the extreme to the nightmare of 3 roommates and 1 bathroom, it was nearly impossible to guess what would be the next subject of the revue, which gave the show a gleeful anarchy that kept the audience energized and alert throughout. It certainly didn’t hurt that the cast was so strong either; Second City mainstage revue veterans Leigh Cameron, Kyle Dooley, Etan Muskat, Kirsten Rasmussen and Kevin Whalen worked the material with ease and newcomer (although far from new to the Toronto comedy scene) Becky Johnson brought a solid variety of character work to the show. There was a chemistry throughout the cast that just made the whole thing a joy to watch and it was clear that director Paul Bates had taken a lot of time to make sure everyone was on the same page with their performances. Probably the highlight of the show was the first act closer; an impressive bit of sound engineering and physical comedy where Kirsten Rasmussen played a drunk clubgoer unable to resist the pull of the music to dance. The rapid shifts of songs to guide her out the door of the club earned a lot of appreciation from the audience for Rasmussen who gave every song a distinct style of dance, no matter if it was 30 seconds long or less than one. Matthew Reid also deserves credit, having created a sequence of quick musical shifts that worked just as seamlessly. Another thing that really impressed me was the skill with which the ensemble used callbacks, turning seeming one-shot gags into payoffs for longer sketches later in the show. One particular callback stood out as it had played throughout the show, finally paying off in one of the last sketches that played nicely into the theme of unwanted advertising, reminiscent of the classic Mitchell & Webb Massive Yacht sketch. If there was any criticism I could give to the show, it’s that a couple sketches that touched on some very interesting topics like white privilege and the western attitude towards food consumption could have been a lot sharper without alienating the audience; instead while they were happy to give the broad idea of the concept it felt a bit too tentative; unwilling to go for the jugular. 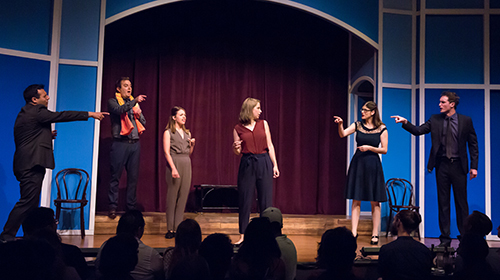 Nevertheless, Click Bait & Switch is a fantastic evening of sketch comedy worthy of the Second City name and I can’t wait to see what comes next from everyone involved in this production.